The RoadPilot Pro uses the latest 2nd generation GPS satellite technology with pinpoint accuracy thereby revolutionising road safety - alerting you of locations of accident black spots, fixed and regularly used mobile camera sites. RoadPilot Pro gives user selectable voice (e.g. "warning speed camera ~ speed limit 50! ~ slow down, slow down") or a series of different beep tones depending upon the nature of the warning. RoadPilot Pro has been discontinued. 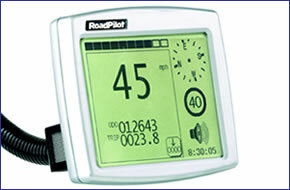 RoadPilot Pro is much more than a road safety aid. The unique "MileageManagerT" button programme enables you to record and analyse your business, commuting and private mileage. If you have Microsoft MapPoint* installed it will even provide you with a report on your PC of addresses with postcodes for the start and finish of every journey. RoadPilot Pro is delivered complete with all parts to enable quick and easy fitment. Simple secure it to the windscreen or dash using the special mounting stalk, in the best position to view the display. RoadPilot Pro alerts you to the locations of fixed speed cameras, including Gatso, Truvelo and SPECS in the UK and six other European countries. These countries include France, Belgium, Holland, Germany and Norway.